The new Star Wars film is a "bloodbath" which deserves its parental guidance PG-13 rating, a critic has said after an early screening of the movie. 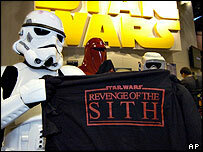 Revenge of the Sith is the first Star Wars movie to receive a cautionary PG-13 rating in the US. Associated Press writer David Germain described its action as "relentless". "It includes sequences more dark and disturbing than anything previously seen in the tragic Skywalker soap opera," he said. Mr Germain was among reporters who attended a screening of the movie at director George Lucas' Skywalker Ranch home near San Francisco on Tuesday. "Young Jedi knight Anakin Skywalker (Hayden Christensen) completes his transformation into black-hearted villain Darth Vader with a bloodbath against old allies," he said. 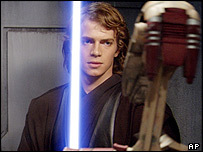 "Anakin is left gruesomely mutilated in a death duel with former mentor Obi-Wan Kenobi (Ewan McGregor). "His surgical reclamation as the part-flesh, part-machine Vader is chillingly juxtaposed against the bleak childbirth scene of his wife, Padme Amidala (Natalie Portman), whose twins grow up to be heroes of the original Star Wars trilogy, Luke Skywalker and Princess Leia." The movie has been given a PG-13 rating due to its "sci-fi violence and some intense images", which warns parents that it could be inappropriate for viewers younger than 13. Lucas said he was getting "a lot of flak" from parents concerned about the film's US rating. "A lot of people saying how can you do this? My children love these movies. Why can you not let them go see it?" he said. "But I have to tell a story. I'm not making these, oddly enough, to be giant, successful blockbusters. I'm making them because I'm telling a story, and I have to tell the story I intended." Revenge of the Sith goes on general release in the UK and US on 19 May. Its UK rating is 12A, which means children under 12 are allowed to see it but only if they are acccompanied by an adult.